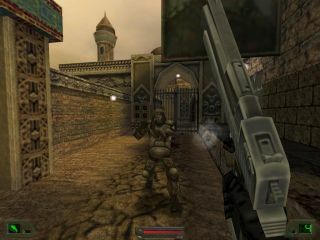 Several days after Soldier of Fortune appeared on GOG. SoFplus, a compatibility mod for Raven Software’s gory 2000 shooter Soldier of Fortune, has disabled downloads and taken its website offline in the wake of what the creator says is "a request to remove or block access to SoFplus files" from Activision, as picked up on Reddit. That’s a nasty-sounding old bug. In addition to this, SoFplus adds a number of compatibility features for modern machines. This includes widescreen video mode support, additional menus to configure settings, default enabling of console, and several others. The SoFplus admin posits that the reason for the takedown request is because Soldier of Fortune has just been released on GOG. Specifically, Soldier of Fortune: Platinum Edition was listed on the site on the first of October, as were Soldier of Fortune 2: Double Helix, and Soldier of Fortune: Payback, the third game in the series. The alleged request from Activision came just two days after the games were released on the platform. The SoFplus admin has contacted Activision for information on how the issue might be resolved so that the SoFplus website can go back online. We’ve also requested comment. You can still visit the cached SoFplus website, but all the download links for SoFplus itself have been disabled until further notice.